I’m over the halfway mark. Yup, 17 days down as a vegetarian; 14 to go. And although January does seem to be moving painfully slowly (possibly because I am counting down the days till I get to eat a burger), I must admit I am enjoying my little experiment. Oddly enough, my particular brand of creativity (be it applied to writing or cooking) does best when there are some limitations attached to it. So deciding what to eat for dinner has actually become easier, rather than more difficult, during Vegetarian January. What’s more, my cause has been hugely helped by all the support I’ve received on social media – followers have been sending me recipes to test, restaurants to try, or even just words of encouragement and support. It’s been pretty amazing actually. One such suggestion was to eat at Spirit – a canteen-style vegetarian restaurant at the end of the (in my view) still-underrated Czar Peterstraat. I took a vegetarian friend along with me (as in, an actual vegetarian – not just a vege-tourist like me) for a second opinion, figuring that between the two of us we could sort the chickpeas from the chaff. The first thing to note (and I think this is important if you’re planning a night out) is that Spirit does not have the gezelligheid factor, in the normal sense of the word. It’s large, brightly-lit, and a tad chilly. The food comes from a long buffet counter (split into cold dishes, warm dishes and desserts) and is paid for by weight. You can order a glass of wine at the same counter as you pay for your food, and your meal will be plopped onto a tray for you to take back to your table. There’s absolutely nothing wrong with this – and the people behind the bar/checkout seemed pretty friendly – but it’s worth noting. This probably isn’t somewhere for a romantic date, a cosy night out with friends, or a spot to impress your eco-conscious clients. With all that being said, if you can find a time and a place for Spirit, the food is pretty good. My friend and I managed to eke out a two-course meal, simply by loading up one plate with cold dishes for our “starter”, and then going back for a second round of warm dishes for our “main”, paying as we went along. 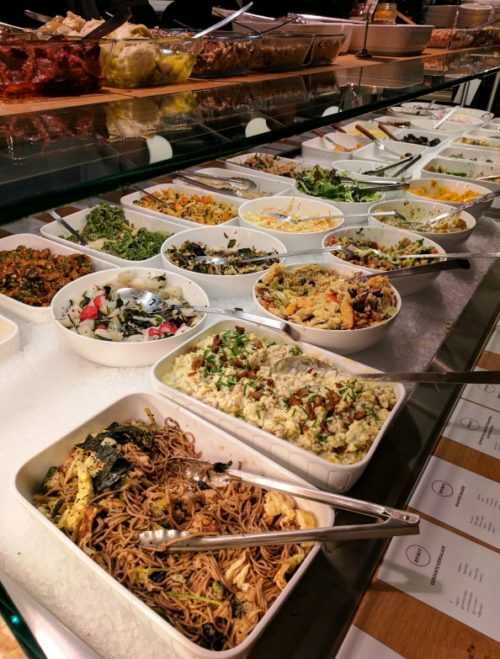 I was particularly impressed by the cold buffet, which included aubergine in what looked like tahini but was in fact a hazelnut paste (my friend claimed it was like eating Nutella! I rather liked it). We also tried the baked andijvie in a mildly spicy chilli sauce; kale and avocado in an Asian-style dressing; an interestingly diverse seaweed salad; and various types of vegetarian sushi. All were packed with flavour, and in no way left you feeling like you were “missing” meat. I was a little less impressed by the hot dishes we tried, which included a goat’s cheese/leek quiche and tofu gyoza – both of which were palate-cloyingly dry. Aubergine lasagne was well textured and voluptuous, but my friend said she missed the bubbling tomato sauce of her favourite vege lasagne (which apparently comes from Fa. Pekelharing) – although in Spirit’s defence it would be pretty hard to achieve that in a buffet-style setting. Red cabbage and apple were well-spiced and wintry, as was the fennel and lentil stew I tried. The only thing I couldn’t finish was the seitan in a sticky Asian sauce. The problem was a simple one: it looked like BBQ pork, but tasted nothing like it. Clearly this is not an issue that every vegetarian will encounter – only the ones who were formerly addicted to pork. Having maxed out on the savoury buffet, we weren’t up for trying the desserts – although they looked quite tempting. Instead, after two plates of food, two glasses of wine and about €25 each, we decided to call it quits at an uncharacteristically early 9 pm (like I said, Spirit isn’t exactly the place to linger over a lengthy dinner). However, next time I’ll come back at lunchtime and perhaps bring my laptop – they have wifi, large tables, plenty of space, coffee… and the food ain’t half bad either. Vegetarian January: Why the hell am I doing this?